Professional cleaners play a critical role in public health, much more than most people realize. Pathogens, also known simply as germs, are present everywhere in public, commercial buildings, especially in hospitals, restrooms, gyms, pools, and other places where humans are most likely to unintentionally exchange sweat and other sources of infection. It is up to professional commercial cleaners to understand the biology of pathogens in order to neutralize them and keep all public spaces clean and safe each day. This is no easy task. Of the potentially 100 million species on this earth, pathogens account for 3 million of them. Humans, meanwhile, are one solitary species. 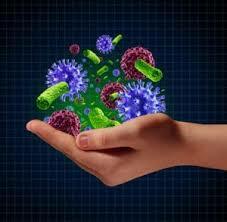 In short, we are wildly outnumbered by microbes and germs that have the ability to make us sick. Pneumonia, tuberculosis, and so many other conditions can be easily passed from person to person when proper preventions are not taken. While vaccinations have helped wipe out many diseases that used to be considered major threats, like polio and the measles, germs are still responsible for spreading E coli, salmonella, herpes, MRSA, the common cold, and more. When you catch the flu or end up with the chicken pox, the infection did not just spring out of thin air. Scientists have identified six components required for an infection to thrive, including an infectious agent, susceptible host, and place to survive. Professional cleaners must break that chain of infection in order to neutralize pathogens from having any power. To begin, cleaners can wipe out infectious agents with the right cleaning techniques and disinfectants. It is up to individuals to keep themselves healthy enough not to become susceptible hosts for infection, but expert cleaners will be able to clean and disinfect well enough to minimize the presence of dangerous germs and inhibit their growth. At the end of the day, cleaning, sanitizing, and disinfecting are the name of the game. We're here to help craft a custom suited cleaning plan to fit any size building in any type of industry. We work with schools, gyms, office buildings, medical clinics, law firms, retail properties, auto dealerships and country clubs. If you're in the business of keeping your business clean - call our business today. Copyright 2018 All Rights Reserved - Royal Building Maintenance.